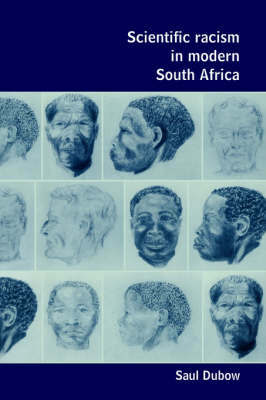 This is the first full-length study of the history of intellectual and scientific racism in modern South Africa. Ranging broadly across disciplines in the social sciences, sciences and humanities, it charts the rise of scientific racism during the late nineteenth century and the subsequent decline of biological determinism from the mid-twentieth century, and considers the complex relationship between theories of essential racial difference and the political rise of segregation and apartheid. Saul Dubow draws extensively on comparable studies of intellectual racism in Europe and the United States to demonstrate the selective absorption of widely prevalent conceptions of racial difference in the particular historical context of South Africa, and the issues he addresses are of relevance to both Africanist and international students of racism and race relations.